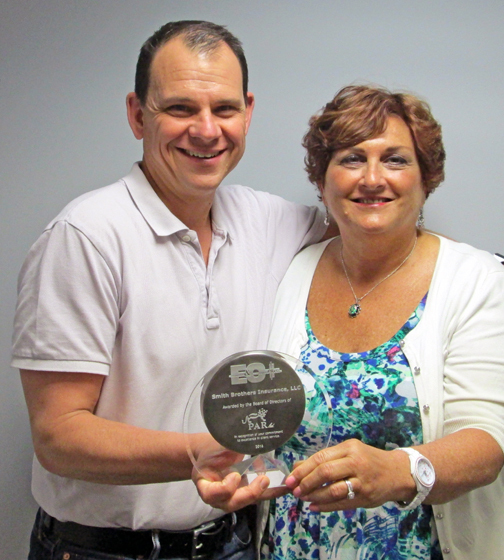 Smith Brothers Insurance Receives National Quality Management Award. Smith Brothers is proud to announce receiving the E&O Plus Quality Management Award. This award is presented to the insurance agencies demonstrating outstanding devotion to quality management in serving clients and a commitment to excellence in the area of client service through mitigation and prevention of Errors & Omissions. E&O Plus is an Errors & Omissions program run by the PAR Ltd. Board of Directors and is set up for larger and regional insurance firms nationwide with a common dedication to high service quality and excellence. PAR Board of Directors, on behalf of the E&O Plus program, presented the award to Smith Brothers. “Your commitment to practicing quality management throughout your organization and working hard to achieve best practices in all client services makes you the best of the best,” stated Jim Hackbarth, Assurex Global President & CEO; PAR, Ltd. President. “It’s an honor to be recognized for our dedication to providing our clients with exceptional service. We are especially proud of our team members who are committed to uphold our Service Standards and keep our promises to our client, as well as our quality control leadership team that established our Quality Program in 2007; it was one of the first dedicated quality control programs of its kind in our industry,” stated Joe B. Smith, President & CEO, Smith Brothers.